A file select screen exists! 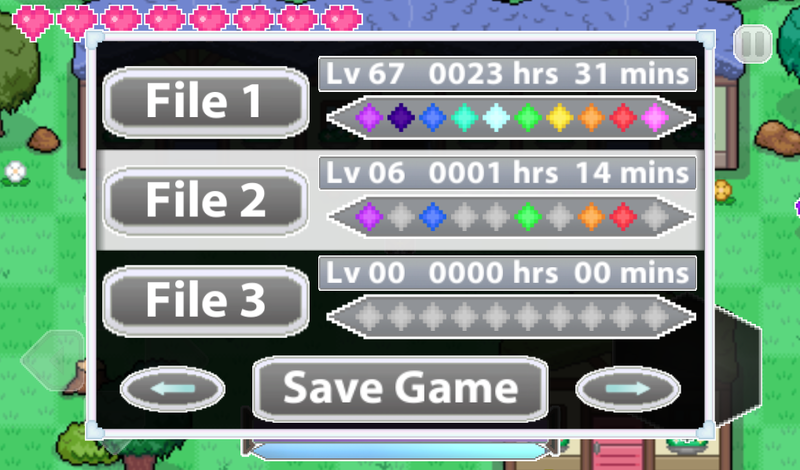 Players can have their save data occupy one or all of the available slots. Player will select a file then push the forward arrow to act or push the back button to return to the previous screen. In the end, it's a lot more elegant than what I had in mind a few weeks ago. I scrapped the idea of custom file names to save time on a virtual keyboard even though my school maze project had me make a keypad with similar behaviors. I just wanted the important information to be stored so players can see how they're doing at a glance. Zelda would show icons of dungeons you beat and how much health you have so I wanted something similar. Since health and the number of dungeons beaten are the same in this game I only needed to show one. I went with showing spell icons that represent dungeons because those are more colorful and fun to look at than a row of hearts. I also wanted players to see how long they've been playing as well as what MP level they reached. Players can touch the button with "File" text on it to select one of the 3 slots. To top it all off there is a white banner cursor that hovers over the file you choose and blinks when an action is taken (like saving). In the end I was able to get everything I wanted to fit nicely in the pause menu window. Coding it all took a while, but everything is working smoothly now. Just in time for crunch time weekend! Let's see if I can shave a few more things off the list!